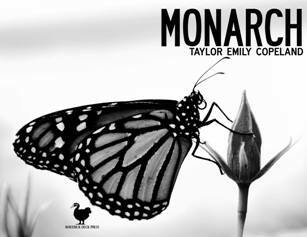 Taylor Emily Copeland - "Monarch"
Taylor Emily Copeland is a poet from Eastern Pennsylvania. She is the author of two chapbooks: "Caffeine kisses and long sleeves" and "Monarch". Her poems have recently appeared in Melancholy Hyperbole, Hobo Camp Review, Thick With Conviction and Chantarelle's Notebook. She is a four time Best of the Net nominee and also was nominated for Best of the Web. She reads obsessively, likes pink things, drinks too much coffee, drives aimlessly and falls in love too easily. She is unashamed of all of it.